It looks like hip-hop duo Killer Mike and El-P, AKA Run The Jewels are getting back into the craft beer business later this month. Their first foray into craft beer came with last year’s “Stay Gold” IPA. Today’s announcement was made on Pipeworks Brewing Company’s Twitter account this afternoon. 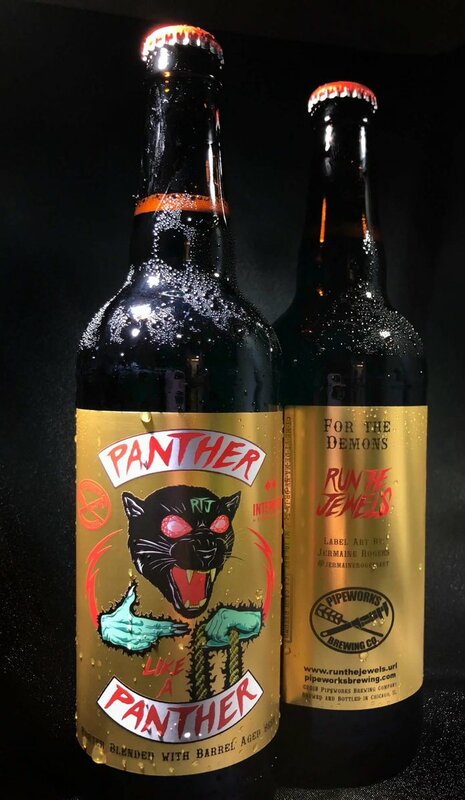 “Panther Like A Panther” Stout, like “Stay Gold” IPA takes its name from a Run the Jewels track. This time however, instead of the beer being brewed using the same recipe, “Panther Like A Panther” will be brewed using three different recipes according to Paste Magazine. …Panther Like a Panther is using three distinct recipes, crafted by each individual brewing partner. Interboro, for instance, is said to be making a traditional stout while Pipeworks is brewing a porter blended with a bourbon barrel-aged beer. J. Wakefield, on the other hand, is said to be brewing a coffee-infused stout with beans courtesy of Miami’s Panther Coffee. I for one am excited for this release. Each one of those distinct styles sounds delicious. I was disappointed to miss “Stay Gold” IPA when it was released last year. Maybe I can take a road trip to Miami in April for “Panther Like A Panther” Stout. For those of you wondering, this isn’t just some gimmick. RTJ has partnered with some of the most highly respected breweries around. Proving the point, the Burial Beer Co./Interboro Spirits & Ales “Stay Gold” was voted #1 IPA in America in 2017 by Draft Magazine. Out of 387 IPAs sampled! I have no doubt that the quality and praise of “Panther” will be just as high. Later this year RTJ will be releasing “Legend Has It” Pilsner (April), and “Double Down” IPA (October). Those of you living in Europe, you will have a CBD infused version of “Legend Has It Pilsner” released in April. There are even some breweries here in the US who are also experimenting with CBD infused beers (where legal). How about it? Any readers in Chicago, Miami or NYC want to pick me up some “Panther”? Please?